This month we're delighted to introduce a new Success Partner doing excellent work in our community, Elizabeth Lutsky. A Chicago native, Elizabeth received her undergraduate degree in psychology at the University of Michigan before going on to earn her Master's in Learning Disabilities from Northwestern. been appointed President of the Los Angeles branch of the International Dyslexia Association. challenges as they strive to become confident, independent life-long learners. Elizabeth sums up her mission powerfully yet succinctly: "Every child is capable of learning. It is our job to teach them how." There was a time when juniors heading into summer break could stay juniors until their first day of senior year. No longer: with summer learning loss ready to pounce, senior year must now begin in July and, as a result, we have a new category of student: the Rising Senior. Students looking ahead to their senior year are now facing more competition for college than ever before. While taking time off during the break is essential for recharging kids' mental batteries, the reality has become clear: those Rising Seniors who don't get a head start on their Personal Statement and Common Application tend to struggle with the bigger academic workload when September comes around. We'll seek out perspectives on this crucial issue from a variety of experts in the academic field. We'll also offer examples of a fantastic option for kids looking use their break productively and gain experience in the professional realm: the Summer Internship. At Academic Success, we believe that maximizing learning opportunities now makes it easier for our students to achieve optimal success when it will count the most. and complex than ever, this informative blog from a college admissions counselor couldn't be more timely. The message is simple: more time spent on college applications in the summer gives rising seniors a better chance at their dream destination at the end of the year. Sometimes amidst all the attention being given to Rising Seniors and the unique challenges they're facing, younger students also thinking about college can get lost in the shuffle. This enlightening article, from the Dean of Admissions at the University of Pennsylvania, offers some excellent advice for both juniors and seniors. Internships have always been a fantastic idea for high schoolers looking to gain valuable workplace experience. Now, major companies are beginning to sweeten the deal for both juniors and seniors. This KCAL 9 report details the growing trend of tech companies offering our best and brightest paid internships that often lead to future success. Not all of the paid internships are occurring in the corporate and tech sector. A program right here in Southern California is enrolling high schoolers in paid internships at non-profit organizations. This heartening story will hopefully serve as inspiration to other kids looking to move forward while also being of service to their community. With so much for our Rising Seniors to think about, getting a little expert help over the summer can make all the difference. 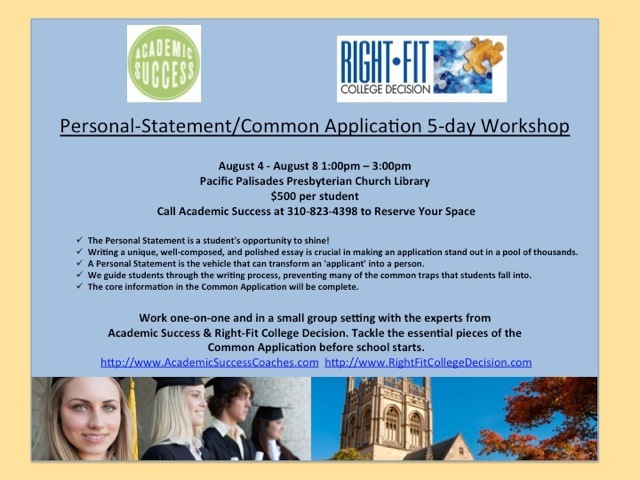 Our Personal Statement Workshop in early August will set Rising Seniors up for the fall and ensure they are in the best possible position to gain entry to the college of their choice. When duty calls, it can be difficult to spring into action if we're not prepared. We've all fallen into the trap of having a work deadline and leaving things until the last minute. This habit is even easier to succumb to while on summer break, with all of its attractions and diversions. One way to ensure you will be able to return to your work quickly without a painful adjustment period is to have your metaphorical "bags packed". For students, this means being ready to shift your mindset and begin your work at any point without having to re-organize your materials and figure out where you left off. Make sure your study area is clean and organized, with the relevant textbooks, study notes and new reading materials set up in order of importance. Set specific study goals to complete before the end of summer. Keep your room tidy so that it feels good to close the door and begin working whenever you feel the impulse. Take time each day to visualize yourself working productively; see your work as something enjoyable that will be personally and academically rewarding. This is the perfect antidote to feelings of heaviness and dread we sometimes have when we know we have work to return to. The more effectively you can pack your mental, physical and academic "bags" before embarking on your summer vacation, the easier it will be to pick up where you left off. This month we're excited to present another fantastic member of our coaching team, Bahar Moheban. Bahar was raised in Los Angeles, California where she attended the University of California, earning her Bachelor of Science in Psychobiology and is currently pursuing a career in psychotherapy. Bahar has been a private tutor for twelve years, coaching a variety of subjects ranging from math and chemistry to English Composition and Spanish language. She is also trained in ISEE test preparation. Bahar's favorite aspect of tutoring is watching her students evolve as they (and she) learn new approaches to problem-solving. She believes that learning stems not from memorizing the subject matter but from cultivating a clear and calm mind, developing organizational skills and building time management and a connection to the material. She knows that each student has his or her own learning style and strives to model each session to meet their individual strengths. When not tutoring, Bahar enjoys playing the piano, singing and writing.